Kleantech can provide top quality custom cleaning machines for a variety of uses. Kleantech caters for ALL industrial situations in New Zealand; trucking, farming, mining, factories; you name it we can do it. Some examples of custom industrial and commercial cleaning solutions are below but contact Kleantech today to find out what we can do for you. Kleantech can build larger machines in excess of 6000psi for removal of barnacles or large areas of rust from the bottom of boats. 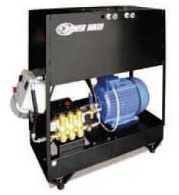 Kleantech can build skid or trailer mounted petrol or diesel machines with LARGE WATER VOLUMES for drain cleaning. 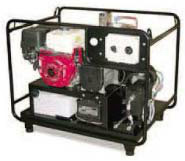 Small units from 3000 psi 21 l/m (13 hp) to 300 l/m 2200psi up to 200 hp diesel motors. These are all made to customers specifications. Contact Kleantech and we can provide you with the combination you need. Kleantech can set up units up with various cleaning points around your factory. A ring main system can have 1, 2 or 3 guns running at the same time. The largest system Kleantech has built is an 8 gun operation. Get in contact and we can talk through your specific requirements. Do you need a cleaning machine that has been custom designed for your specific requirements?